One of my favorite authors, H.P. Lovecraft, said "Toil without song is like a weary journey without end." Music and songs have always been in my life and the music on which I was raised has influenced my work. I have always been enthralled with music that was created before me, from classical pieces to 70s songs, and sometimes they inspire my titles. 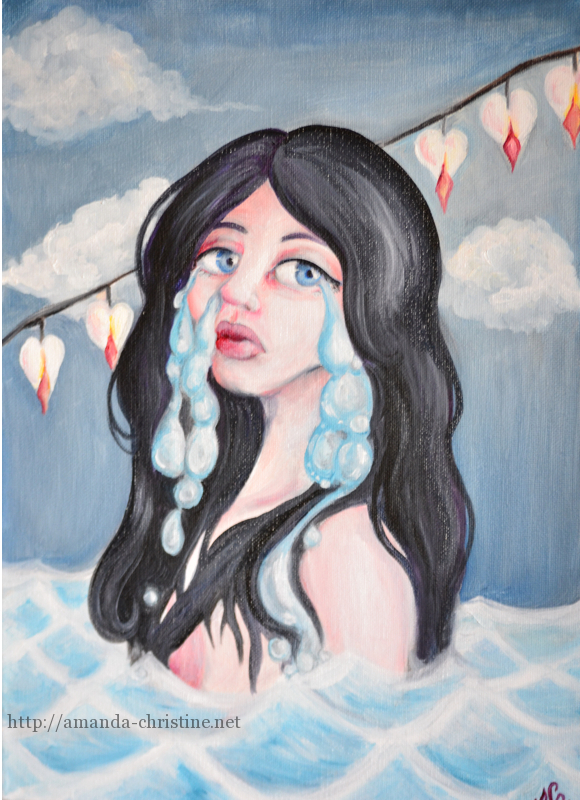 One of the latest oil pieces I have finished is such a piece- "Don't Leave Me Drowning in My Tears", with title credit given to the Glen Campbell tune that was a hit circa 1971 performed by Hamilton, Joe, Frank, and Reynolds, and you will hear it on any "oldies" radio station -you probably won't hear a DJ give you this information, just a cut to a waterbed or car commercial- or you may possibly hear this as part of a supermarket or retail soundtrack. We hear songs like this every day and they become a natural part of the soundtrack of our daily lives, sometimes leaving just a snippet of lyric in memory... "don't pull your love out on me baby"... maybe now you recognize it. I have used song-inspired titles that can be attributed Steve Miller and Donovan as well. Visit my image galleries to see more song-inspired works.